I have a confession to make: I don’t play a lot of golf. I tried to go golfing once, but I had to stop because I ran out of balls. Apparently a gross just doesn’t get you far these days. Must be the economy. That doesn’t mean, however, that I wouldn’t want to get the best equipment when I go out. I worked for three years in sports retail and can understand the effect that not having the right gear can have on someone’s game. 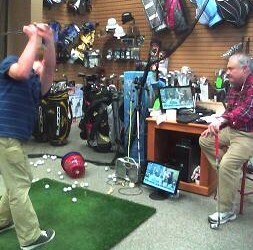 Wanting to get fitted for some clubs, I asked my buddy Andrew Walker, who happens to work at Pro-Am Golf USA, for some help. After laughing at me for a good five minutes, he agreed to bring me down to the store for a fitting. Located on Brentwood Boulevard about ten minutes south of 170, Pro-Am is pretty tough to miss. There’s even a putting green out front. I managed to shoot a 6 on that hole to the left. That's what I call improvement. I walked into the store a bit uncertain was immediately put at ease by the staff. This place is a golfer’s dream. They have just about anything you’d need to create your own Happy Gilmore success story. Owned by the DeGrand family since 1975, you get a sense that when you come in here, you’re gonna be talking to professionals. “Well that’s just common sense. Any place that sells sporting goods has experts,” you might say, but that’s not always the case. I once went to a big chain sports retailer to get roller-blades when I started playing roller-hockey. I have a size 9 shoe, but after being “helped” by the in-store staff, I ended up walking out with a size 12. Thanks, guys. Something like that won’t be happening at Pro-Am. I worked with Craig West, who was extraordinarily patient with me while he helped me out. After finding a proper length club for me, we headed back to the practice area they had set up so I could hit a few. Pictured: not a golfer. Look at that beer gut. I took about a dozen hacks and even managed to hit one or two. Clearly, I’m not a golfer. 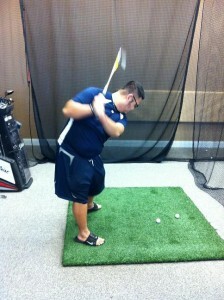 After that, Craig had me take a few swings with a Mizuno Shaft Optimizer. It’s pretty much a club with a sophisticated accelerometer that measures the acceleration and force of your swing. With this, they can recommend what material the shaft of your clubs should be comprised of. Following that, I took a few final swings on top of a flat surface so they could measure the angle at which I was swinging. Once all this was done, they entered the measurements into a computer and gave me a recommendation of the clubs I should get. My attempts to use the ReviewSTL credit card to get a set were rebuffed by my editors, so for now, my custom titanium clubs remain just a pipe dream. The origins of Pro-Am Golf USA go back to the mid-1970’s with a simpler idea in mind: a driving range off Union and Lindbergh. “We started the corporate down at the driving range,” explains Todd DeGrand, Tom’s son and one of the owners. “When we were down at the driving range, it was my dad, my brother, and myself giving lessons. We would do the corporate end and we would manage the retail store, and it was a good time, but we just didn’t have the space.” From there, the business expanded to a second retail location off Hanley coupled with a storage warehouse on Manchester. The retail side of Pro-Am Golf opened up in 1999, but they soon realized they’d have to expand. 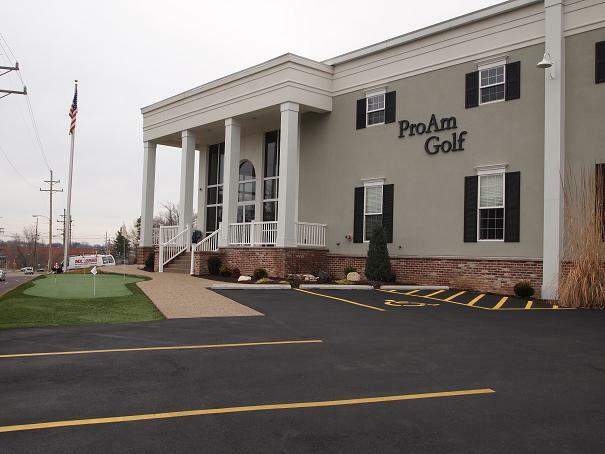 Within a few years, Pro-Am opened up a second location in Columbia, Missouri, less than two hours away. Finally, in 2009, they had the opportunity to purchase the building at their current location, 3174 South Brentwood. 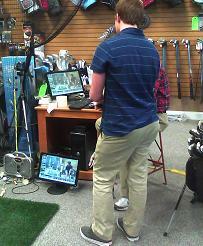 The DeGrands sold the driving range last year, but still offer the aforementioned lessons in-store. ...and immediately watches it with Tom to see what he can work on. Still, despite their success, the people of Pro-Am strive to remember their roots. They are currently working out an expansion plan to open up new stores to further reach golf enthusiasts, but they also want to temper this with the dedication to quality customer service. In such an uncertain economic climate, the DeGrands are making sure they can maintain their level of quality without cavalierly opening up new shops in the hope of blindly turning a big profit.